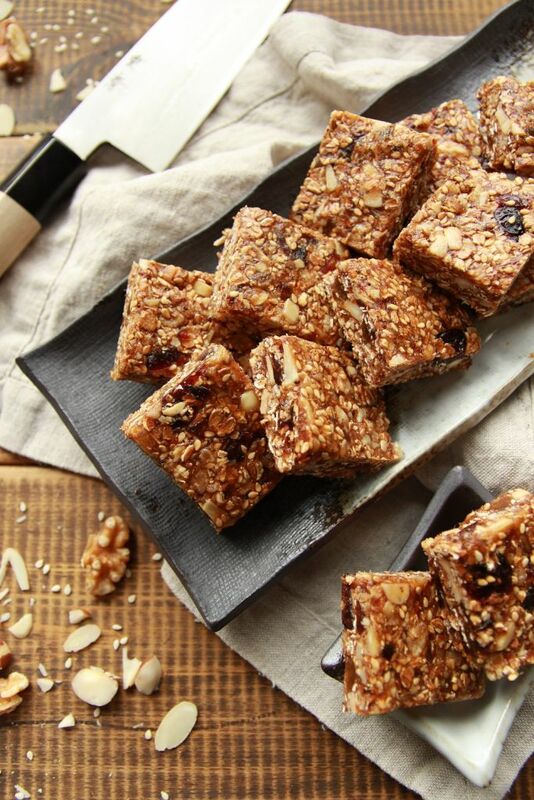 These crunchy and lightly toasted, refined sugar free homemade energy bars were a life saver while I was travelling with my hubby in Japan. They were easy to store, kept me energized on the plane, tasted incredible throughout my entire 10 day trip and only took me roughly 15 minutes to prepare. My initial thought was what would I bring with me to keep me energized on the plane? 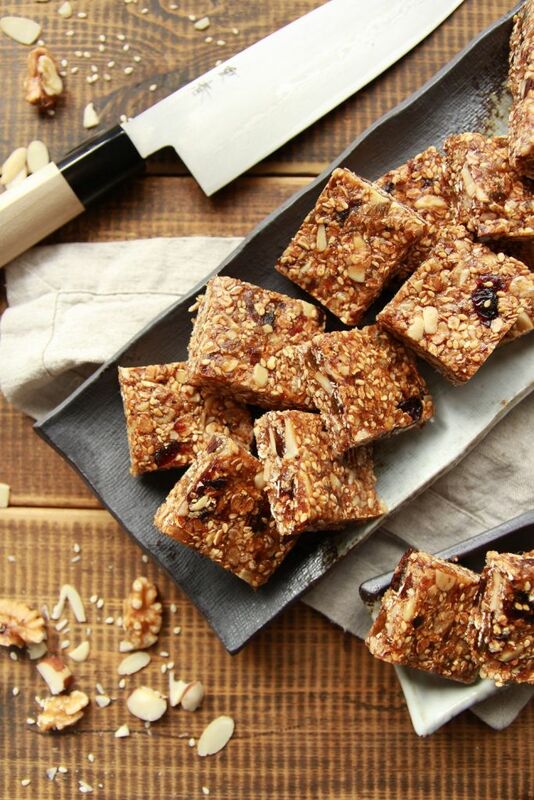 That’s when I thought of these quick and easy homemade energy bars. They would fill me up, keep me energized, and I wouldn’t have to worry about storing them in the fridge, since the destination I was heading to was extremely cold. So, the day before my flight I briefly stopped at the store, then returned home and began sorting through all the goods I bought. 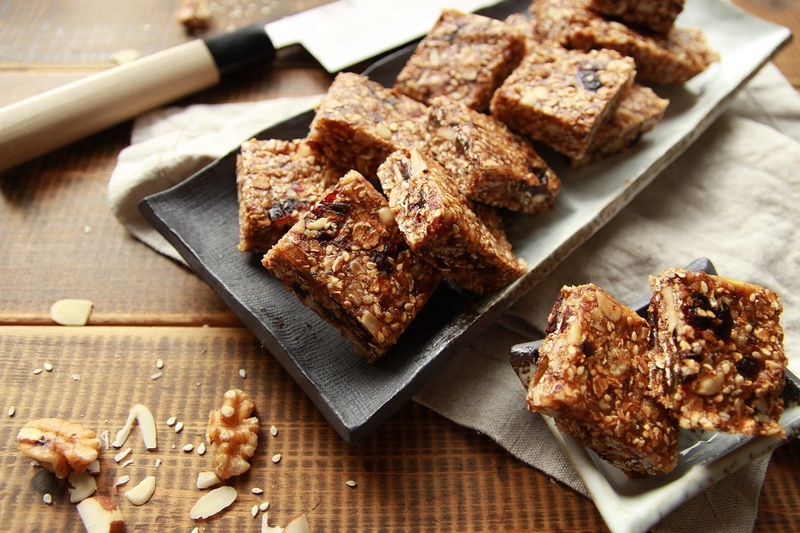 Place the walnuts, almond flakes, and brazil nuts on a baking tray lined with baking paper. Next, evenly place the rolled oats and sesame seeds on a separate baking tray lined with baking paper. Pop both trays into your preheated oven for 5 – 10 minutes, until the sesame seeds or almond flakes start to lightly color, then take both trays out to slightly cool. In the meantime, place the puffed rice, sultanas and cranberries into a large bowl and set aside. Next, roughly chop the brazil nuts and walnuts, and add them to the bowl along with the sesame seeds, oats, and almond flakes. Finely chop the medjool dates, pits removed, and place into a small pot along with the almond butter and date syrup. Heat it on low heat until the mixture is warm, then add it to the bowl and mix well until combined. I use a glove for this part, and squeeze the mixture together and everything has combined. Transfer into a 9-inch x 7-inch pyrex tray (23 cm x 18 cm) lined with baking paper, and firmly press the mixture into the tray. Pop it into the freezer for 10 – 20 minutes, then take it out, and cut into desired size. Store in the fridge and enjoy for up to 2 weeks. 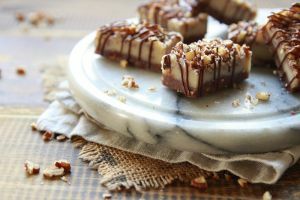 You may also like my No Bake Pecan Bars.